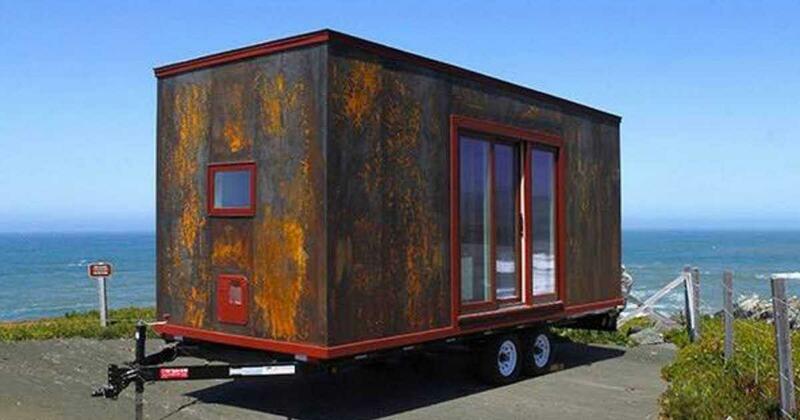 I hardly ever came across a tiny house lover who doesn’t know about Tumbleweed tiny house. 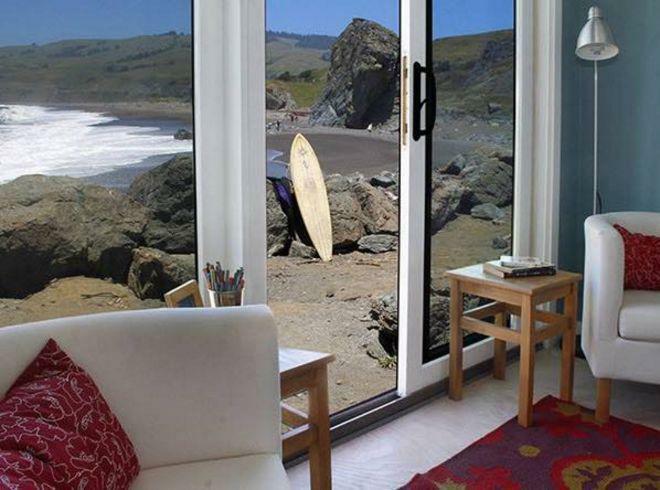 The Sonoma, California based company have made dreams come true for many tiny house lovers. 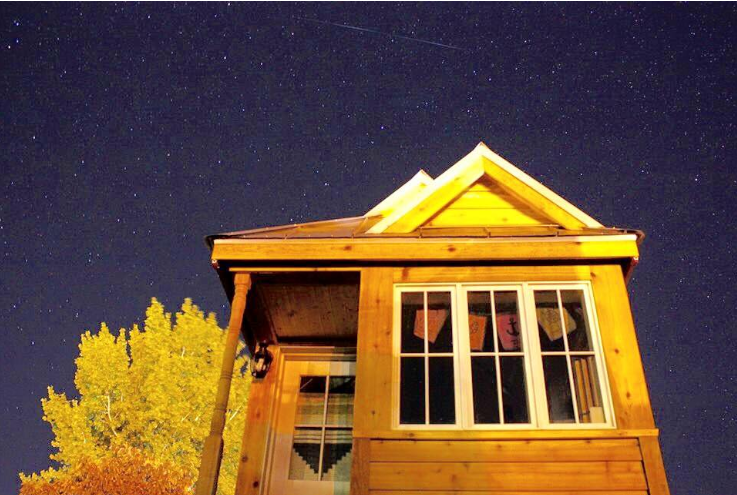 Without wasting time, let’s have a look at 13 amazing Tumbleweed tiny houses. Time to fall in love now! This rustic Tumbleweed house is known as Roanoke. It includes all the amenities that you will need in a nice modern look. Its unique features of high ceiling and open floor plan makes it even more comfortable to customize and live with your family. The high ceiling design allows for building such lofts as you can see from the photo. 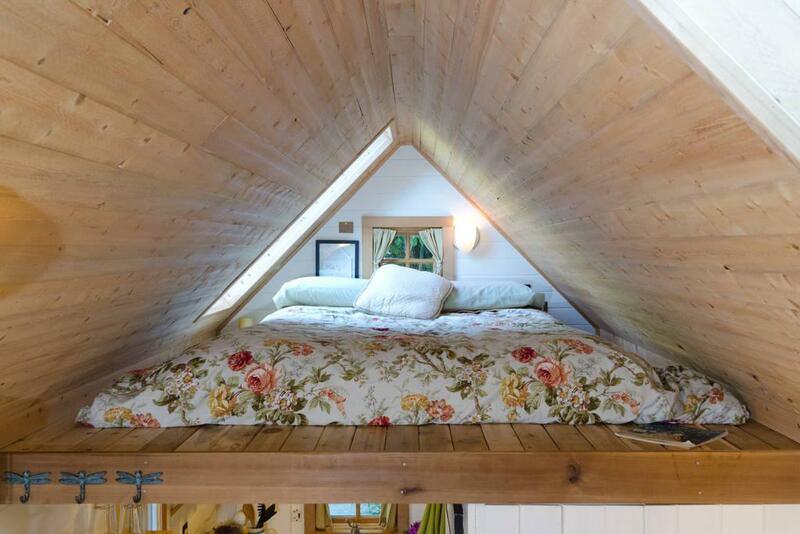 You can even see a little bedroom under the loft. The bedroom is bigger than you can imagine. 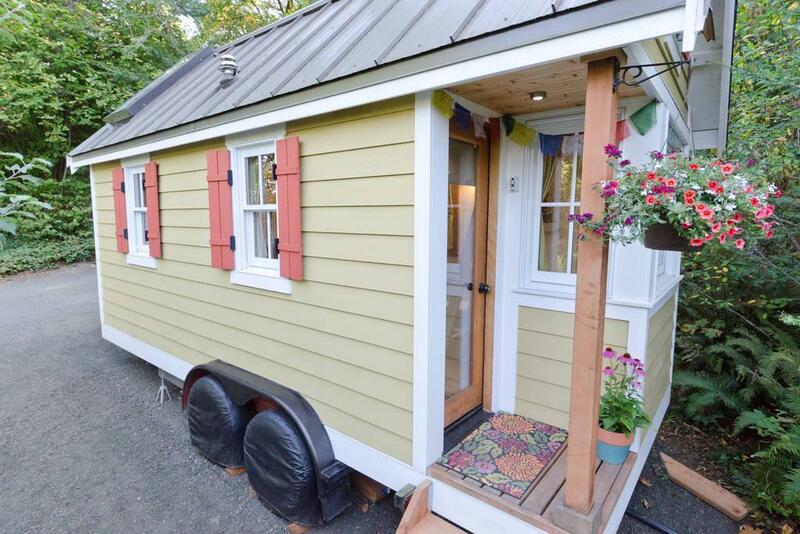 Who said tiny houses are always tiny. Don’t worry. 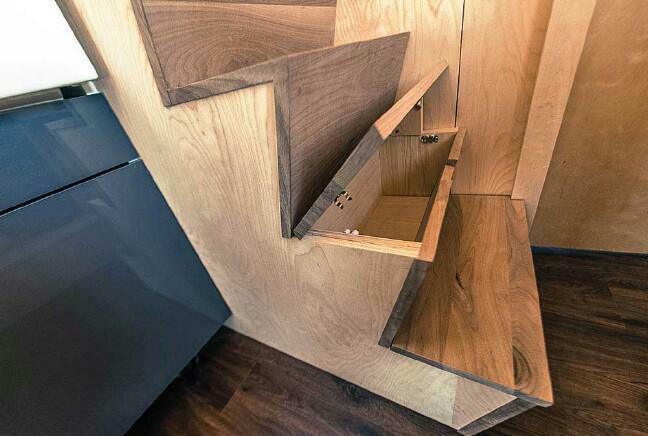 It has built-in storage spaces all over the house. This is just one of them! Cool! For more, check out here. The Tumbleweed equator was built in 2016. 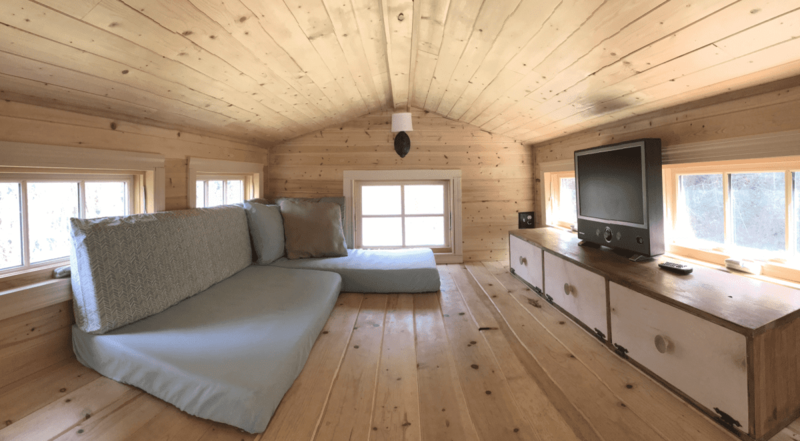 The whole house is made from knotty pine. It is currently on a sale as its owner is relocating. 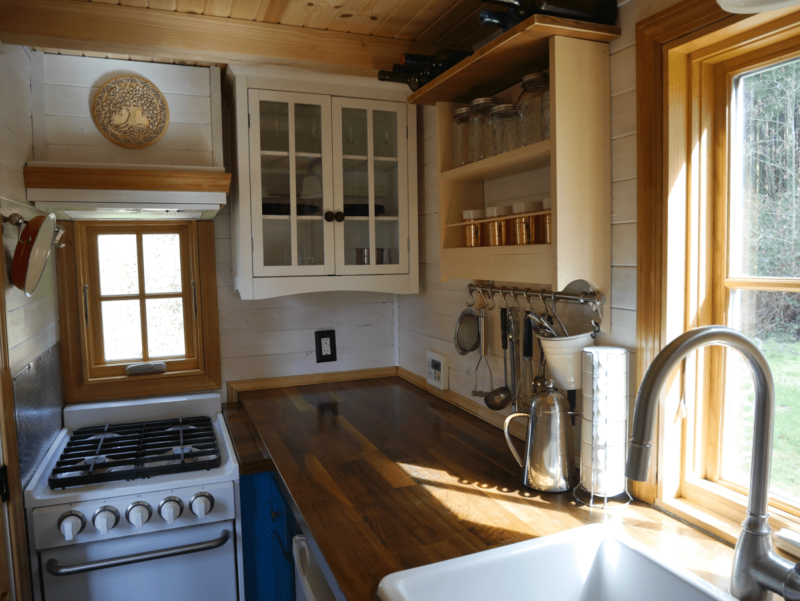 The kitchen is minimalistic and has a beautiful finish to its woodwork. On top of a staircase, you can see a lofted bed. 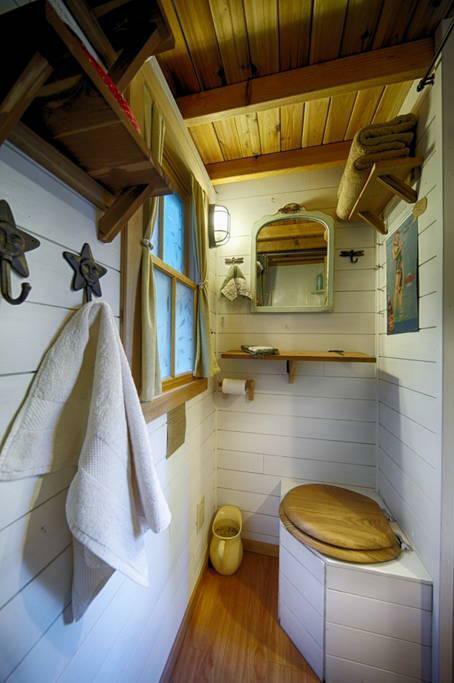 Great space saving ideas which can be seen in most of the Tumbleweed tiny houses. How many windows can you see in the bedroom? 1, 2, 3, 4? 4 windows for the lofted bedroom and that’s tons of natural light for you. Tumbleweed has been an inspiration for many tiny house builders. 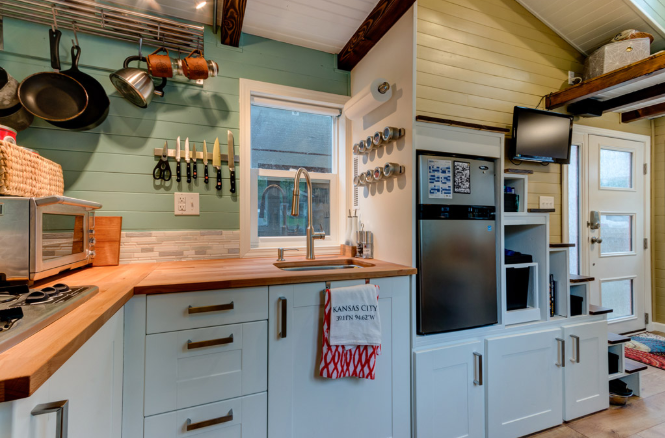 This Bayside Bungalow based in Olympia, Washington is yet another great tiny house from Tumbleweed. The home is bright and beautified through lovely furniture all around. 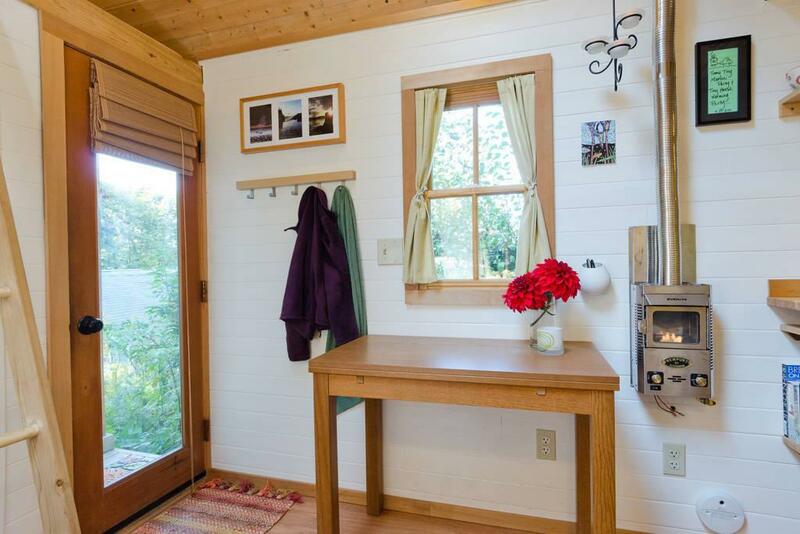 What I love about this tiny house is the white interior color. This makes it look elegant and Cozy. 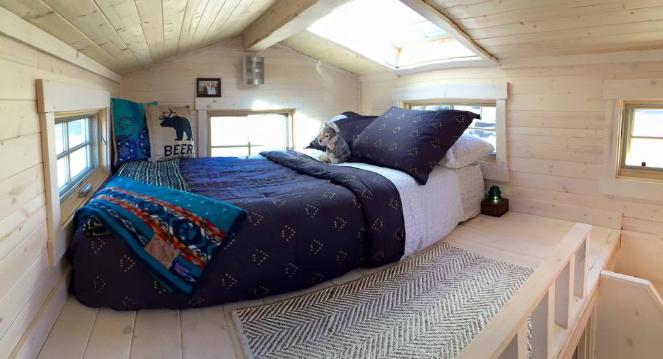 The home features yet another lofted bedroom. The pyramid shape is customized to the owner’s satisfaction. The wooden toilet frame with the sparkling white makes a good combo for a bathroom. You can quickly notice the space saving ideas applied here. 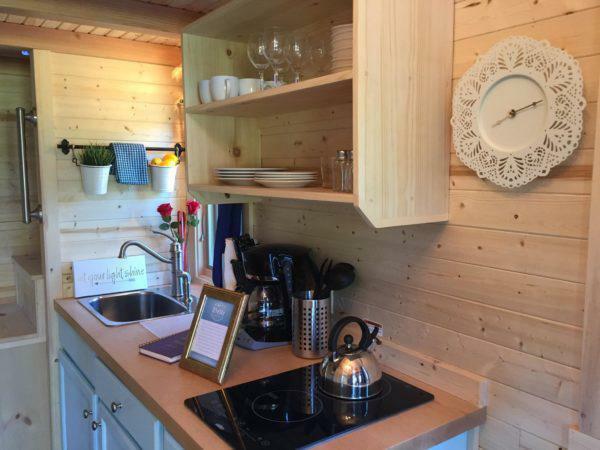 The tiny cottage is customized based on plans from Tumbleweed. The owners’ love for the home can be seen in the eclectic decor and atmosphere of the house. A lofted workspace and an open kitchen are what indeed makes this home lively. 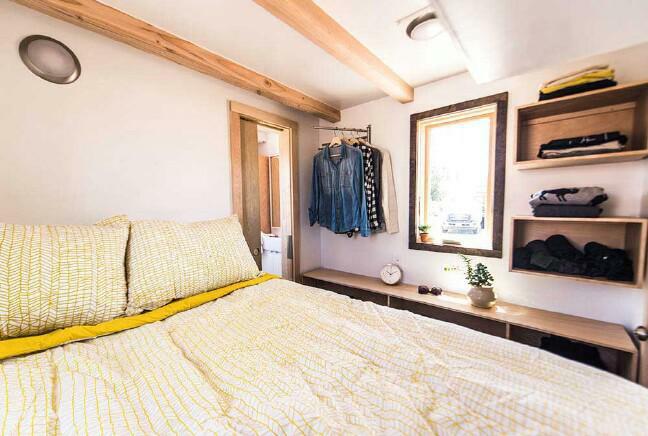 Presenting you the sleekest tiny house ever! One of the best I have seen from Tumbleweed. 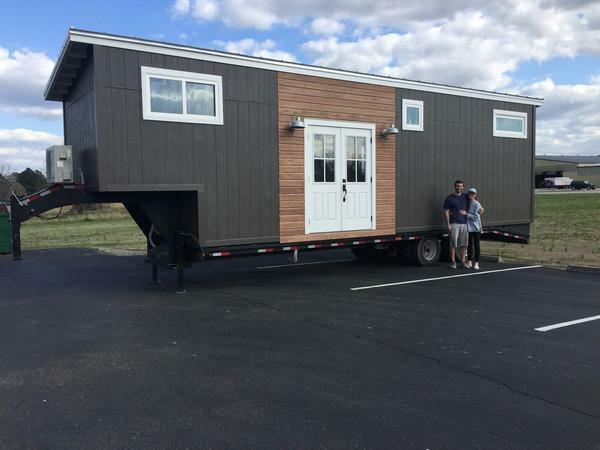 This tiny house known as the fifth wheel is the home for Brain and Skyler. The home is a deviation from the signature loft bed of Tumbleweed. Instead, just a raised platform is used for the bedroom. Tumbleweed tiny house also sells floor plans. This home is built on one of the floor plans from them. The bright white home in the middle of the green is soothing to watch. 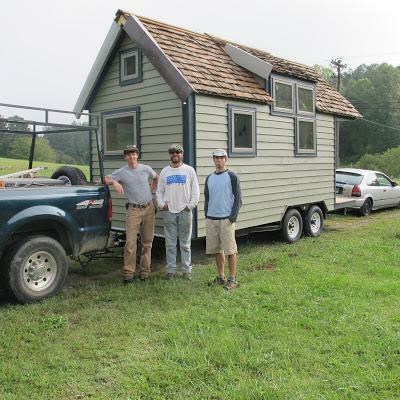 It’s a 681 square feet home with two bedrooms. The brilliant floor plan also allows a third bedroom to be built. 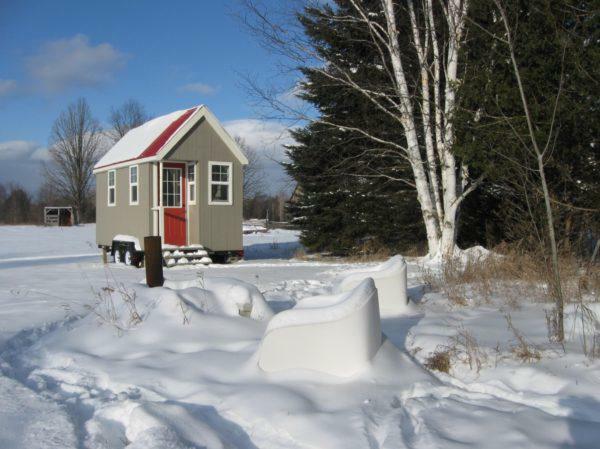 You can buy this Tumbleweed home based in Perth Ontario in for just $24000 (back in 2015 tho 😅 ). Why I love it? Because it could be great for a backyard office. The only backdrop is that it doesn’t have a toilet and facilities for cooking. 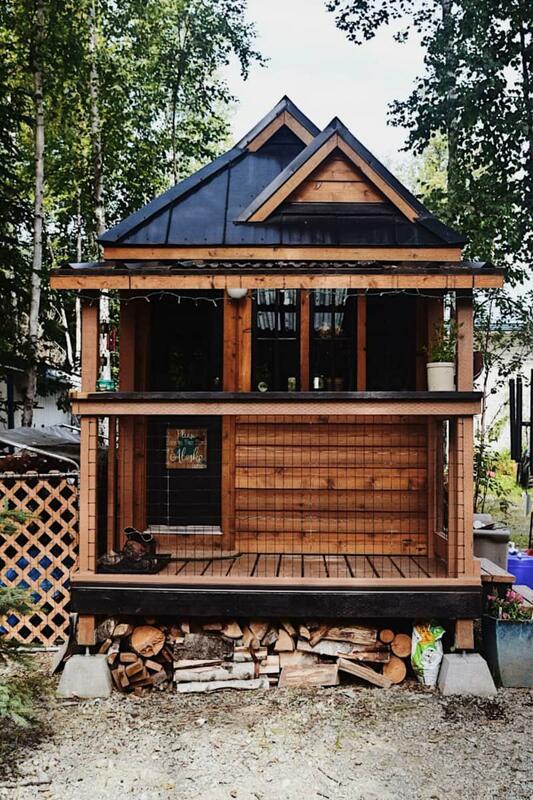 In the woods of Atlanta, Georgia, this tiny house is a beauty to see. It’s originally designed by Tumbleweed. The wooden works in this house design are perfect for blending into the woods. Walnut trim is used all over the kitchen and the home. You can see concrete countertops and a chop block. For those who don’t know what a chop block is, it is a combination of poplar, maple, and walnut. 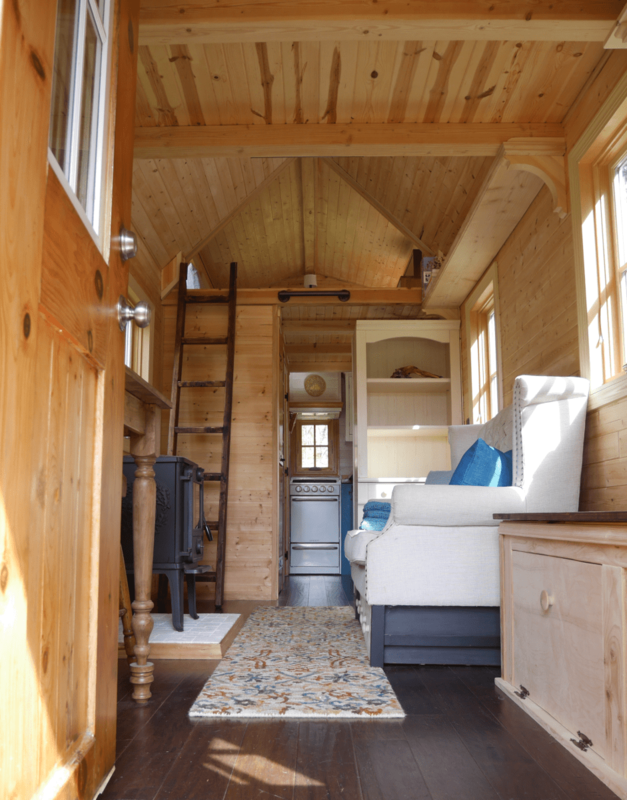 Your home can undoubtedly look like theirs if you have a tiny house in your possession. 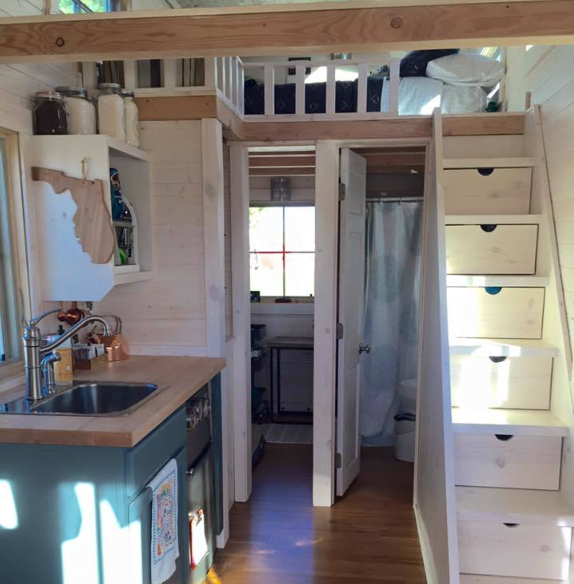 Here is another beautiful creation from Tumbleweed tiny house. The interior was designed by the owners as it came in open floor plan design. 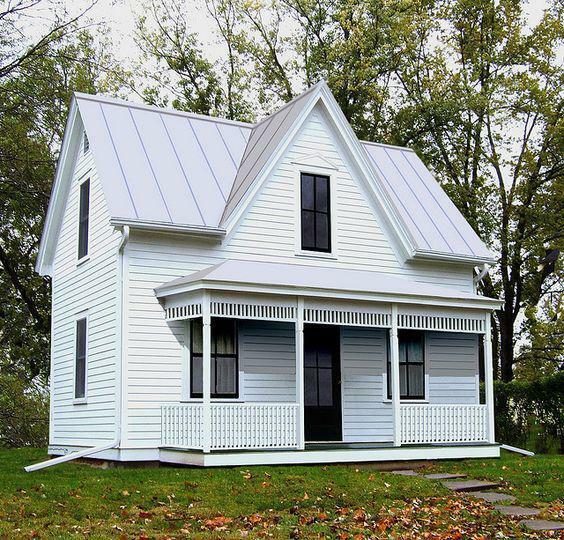 It sure looks like a traditional home, but surprisingly it’s only 250 square feet. From the kitchen to the living room, natural light is the key in this design. 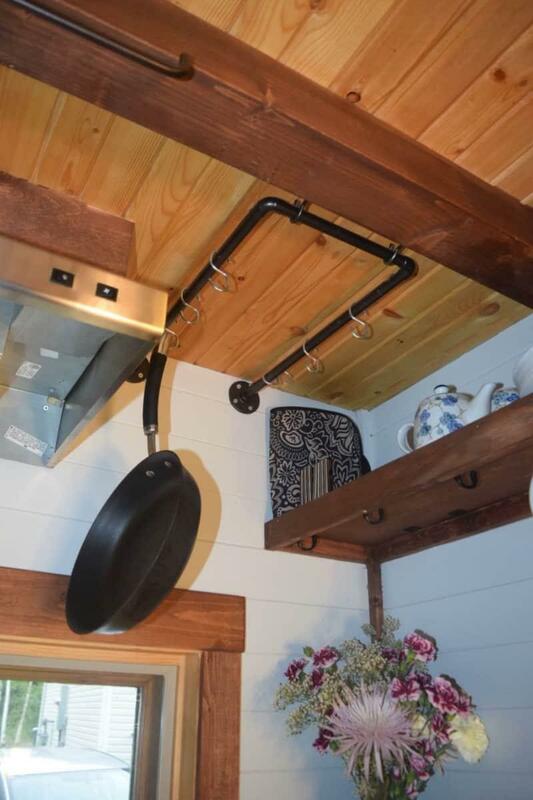 The kitchen is made in a country style and yes with space saving ideas. 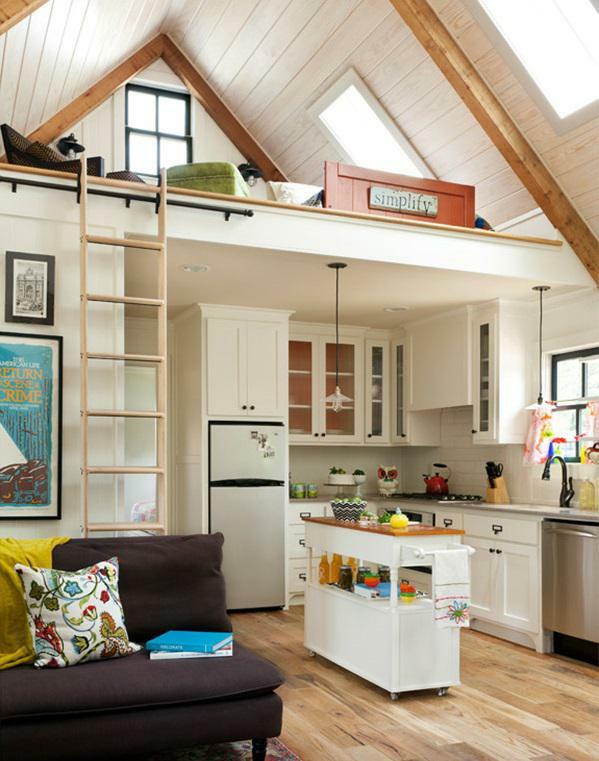 The loft can be used for sleeping, workspace or just about anything. What’s important is you have plenty of space here. 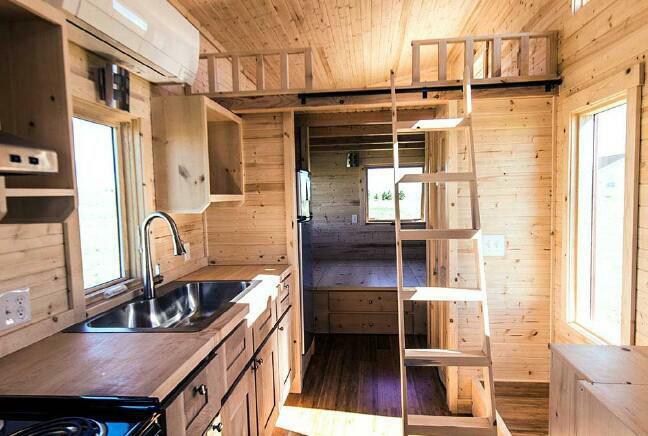 The tiny house based in Alaska built on the floor plan of Tumbleweed Cypress. It’s impressive because you will hardly find any home as cozy as this one. The home is finished with sealed Cedar. 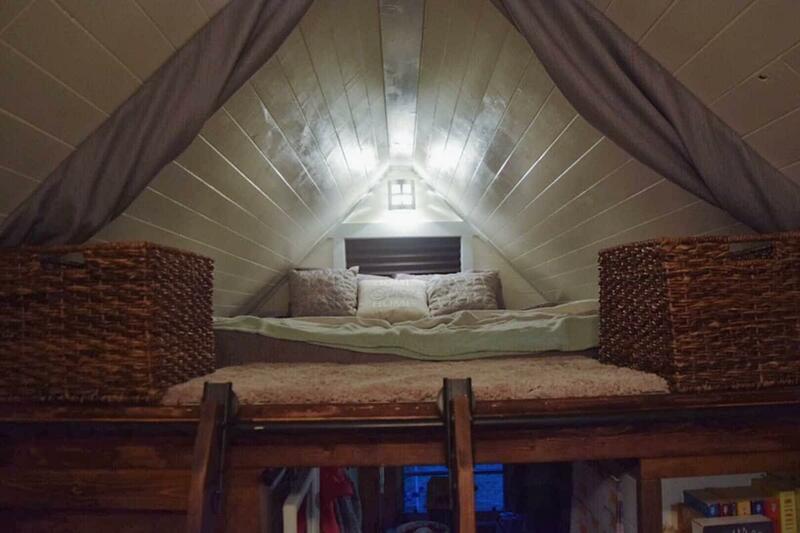 The lofted bedroom might not be too much spacious but who cares, it’s a tiny house after all. 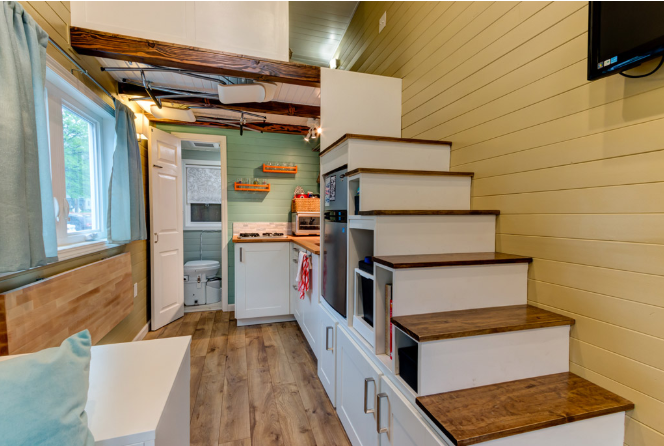 Some wonderful tiny house space saving ideas are also applied in the kitchen. 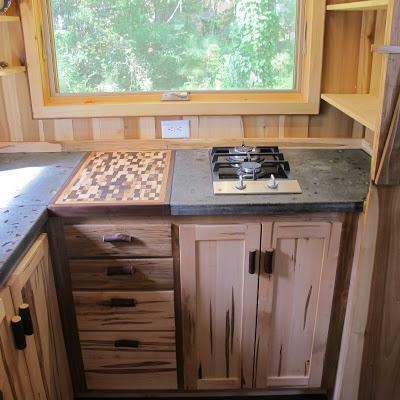 This creative kitchen and the entire house can be yours for just $62,950. 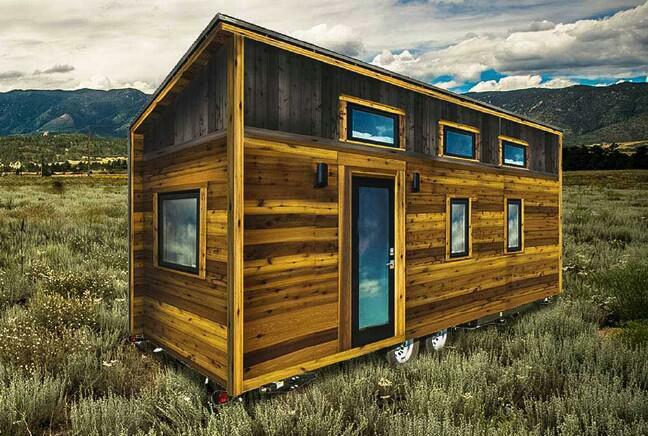 In the Colorado Springs, you will find this majestic tiny house known as the wanderlust. 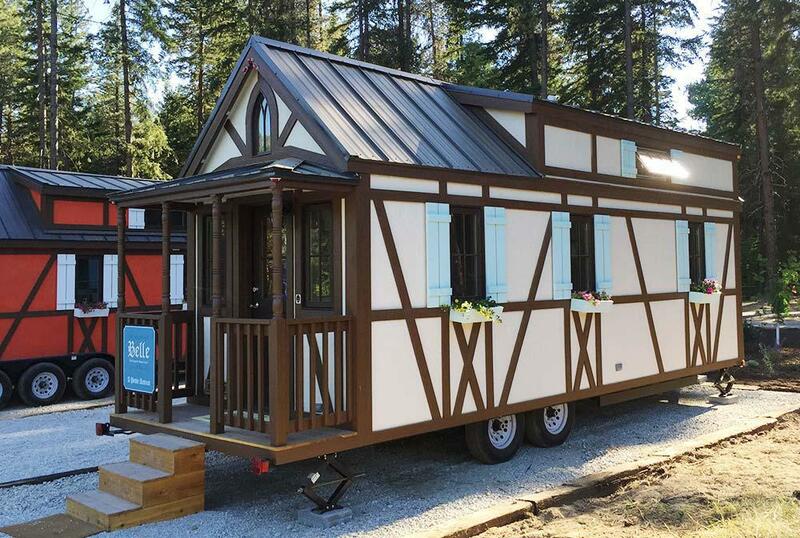 It is built with a trailer and best for vacation usage. Mini fridge, Tv and a mini kitchen, too cute. Can’t imagine living and traveling at the same time. The staircases are carefully prepared with hollow shelves. 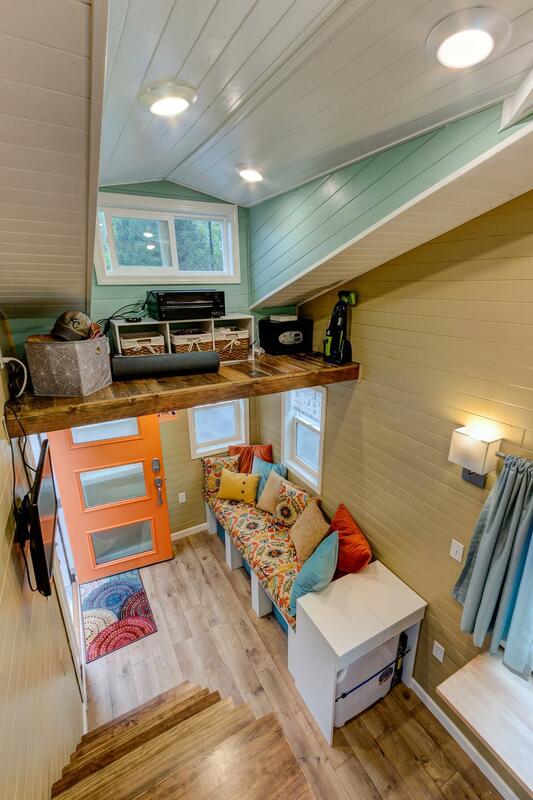 Each and every part of this tiny house saves space. You might have seen lofted bedroom or workspace, but here a storage space grabs the attention. 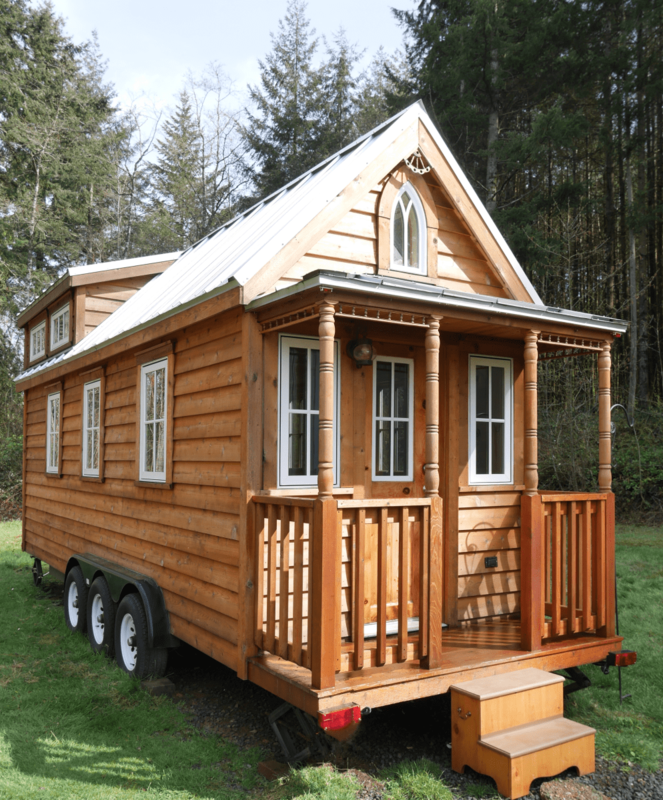 Known as the Belle Tiny house, it’s a modified version of Tumbleweed Elm. The trailer on which it is built is low-wide. 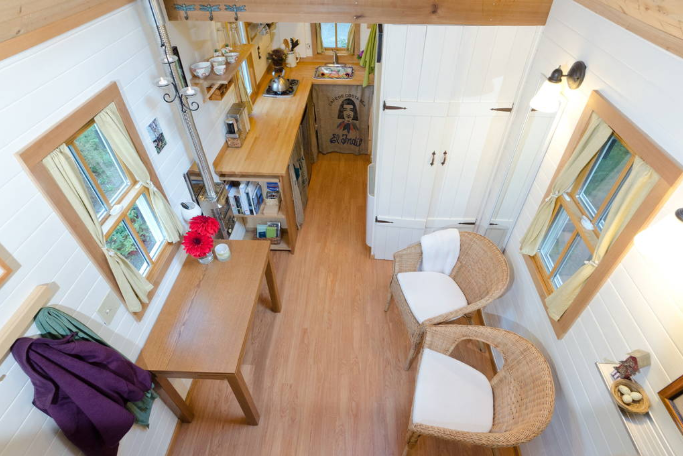 The best thing about this tiny home is that the interior is very spacious. 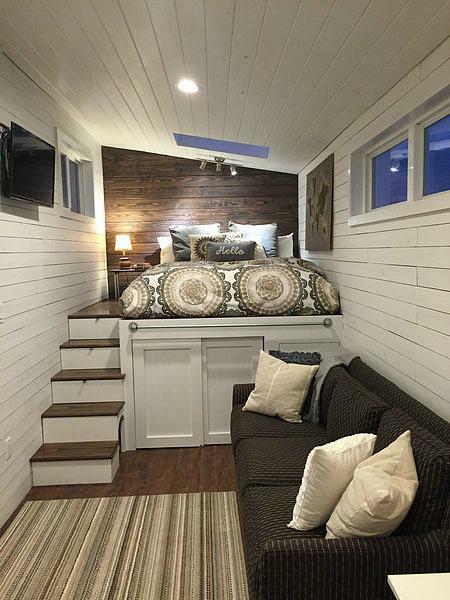 And the bedroom is built with privacy in a lofted style. The kitchen is minimalistic and appealing. I can even see an electric cooktop. Fuel saver! 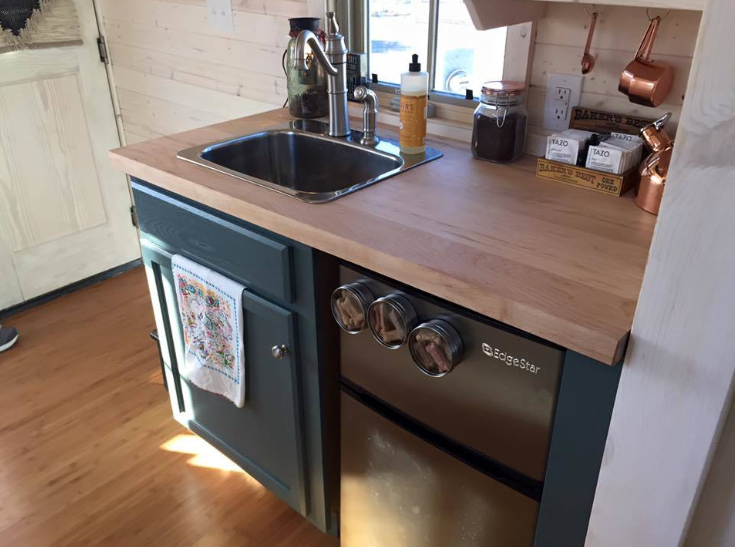 Among the four recreational vehicles sold by Tumbleweed Tiny house, Mica is the best for someone who lives alone. The rusty color is the result of silver oxidizing with water, and many love it just because of this. The interior looks are modern and well decorated. 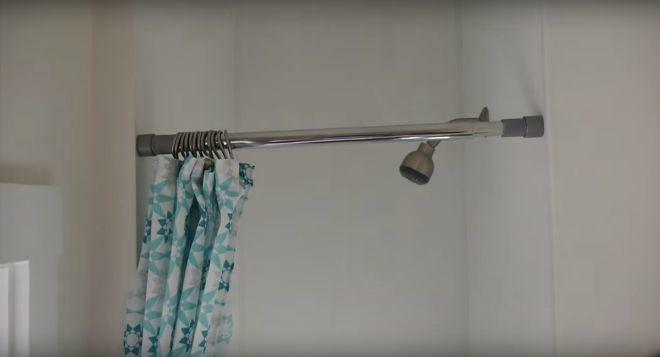 The shower can be connected to either a sewer or an external holding tank. But who cares, you can bath in any way you like. 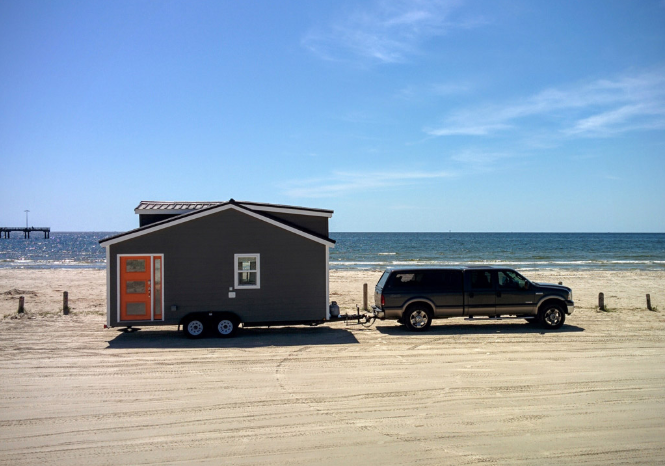 So just a quick recap, I have collected some of the best Tumbleweed tiny houses here for you. Many of these are custom made and built from true devotion. 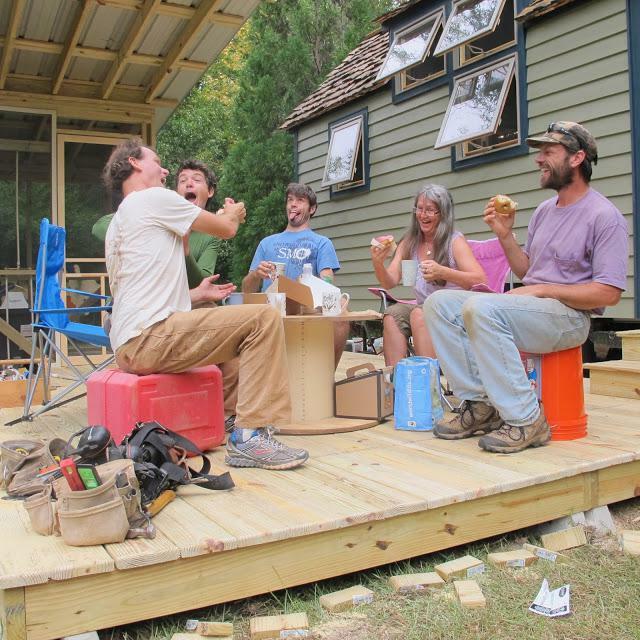 Tumbleweed provides open floor plans and fully ready made tiny houses. You can buy in any form. The list will give you inspiration and ideas for your future dream home.